Rangers GM Jeff Gorton says he is encouraged by this season, and will do everything to 'advance the rebuild' during the offseason. 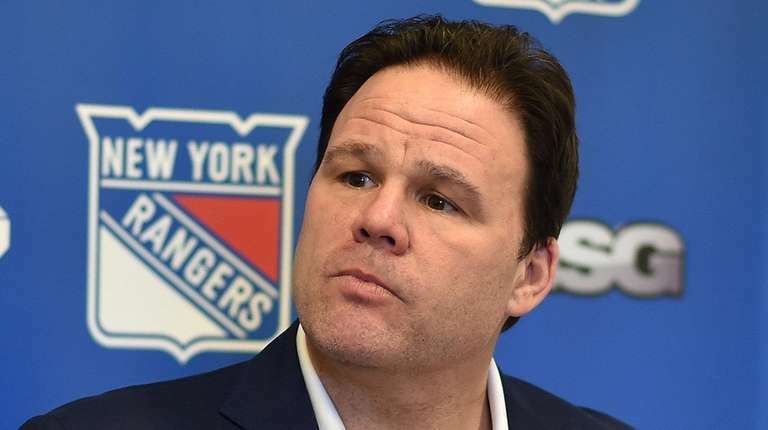 GREENBURGH, N.Y. — The Rangers’ rebuild is going according to plan, general manager Jeff Gorton said Sunday. The next step could be an active summer in which the Rangers dive into the free-agent market or start trading some of the draft picks they’ve collected during the past couple of years to try to speed up the timetable. “We’re at a place where you have to look at everything,’’ Gorton told reporters at breakup day Sunday, a day after the Rangers won their final game of the season, beating the Pittsburgh Penguins in overtime, 4-3, to finish 32-36-14. So yes, the Rangers might try to sign a free agent such as Artemi Panarin, who scored the winning shootout goal against them Friday night in the Columbus Blue Jackets’ 3-2 victory at the Garden. Panarin also scored in regulation in that game and hit the crossbar twice. Panarin will be 28 in October, and the 28 goals and 87 points in 79 games he put up this season for the Blue Jackets would look very good in the Rangers’ lineup. Also potentially on his way is 2018 first-round draft pick Vitali Kravtsov, who had eight goals and 21 points in 50 games for his team in the KHL, Traktor Chelyabinsk. Gorton said the Rangers are in contact with Kravtsov, whose KHL contract will expire at the end of this month, and hope to have him come to North America as soon as possible. Goaltender Igor Shestyorkin, whose SKA St. Petersburg team beat CSKA, 3-2, on Sunday to force a Game 7 in their playoff series, also could come to North America next season. The team they’ll be joining is one that Gorton believes will be on the rise. The first thing Gorton intends to do is bring a mysterious lucky charm with him to Toronto on Tuesday for the NHL’s draft lottery. The Rangers currently hold the sixth spot in the pre-lottery draft order. The Rangers have a 7.5 percent chance of winning the first pick overall in the lottery and a 23.3 percent chance of jumping up into the top three picks. They also could fall back in the selection order, of course, if someone behind them wins the lottery and jumps ahead of them. Notes & quotes: F Jesper Fast had surgery to repair a damaged ligament in his right thumb. His recovery time is expected to be six weeks and he should be ready to go by the time training camp starts . . . LW Chris Kreider and D Brady Skjei will play for the U.S. team in the World Championships . D Tony DeAngelo has not been invited by Team USA but said he would go if asked . . . G Henrik Lundqvist and C Mika Zibanejad said they will wait and see before deciding whether to join Sweden’s team, and G Alexandar Georgiev said he is hopeful of getting called up to Russia’s squad.